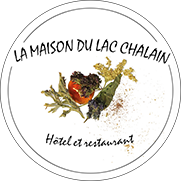 For welcome you greatly in our hotel situated in Jura hearth at two steps of the chalain lake, here is the common services of all our rooms. The semi pension cook is totaly homemade, like nos menus et carte. All our room have toilets, shower and flat screen tv. The stay taxe ( in extra ) is at 0.75€ per person and per night ( from the age of 18 ). The semi pension price relate adult person. for a semi pension with a kid, contactez-nous. We inform you that the deposit paid (about 30% of stay) confirmed a booking, are deduced of the complete stay and are non-refundable. All booking stay need to be paid(deposit deduced). no cancelation are alowed during the stay. Please program your arrival between 5pm and 7pm. in case of later arrival please inform the reception of your residence. The room have to be free before 11am, the departure day.